A glass of wine in hand, London streets outside the window, dancing flames of live fire close by. This magical atmosphere accompanies the clients of Dalla Terra wine-bar who are looking for the moment of rest and real relaxation in the city hustle and bustle. Among the refined wines, imported from the farthest places in the world, hypnotizing fire closed in a classic form of bio fireplace attracts our attention. The flash brightens the interior and fires up the senses. Hidden among decorated bottles and vases enjoys and seduces, but does not dominate, does not predominate over character of place, does not derange the essence. It causes that enjoying delicious taste of wine is real luxuriousness. Bio fireplace was designed in minimalist spirit, it’s the perfect arrangement element and unique ally of get-togethers. Glimmer of flames creates the intimate atmosphere, encourages to lead long conversations, brings on the mysterious aura. 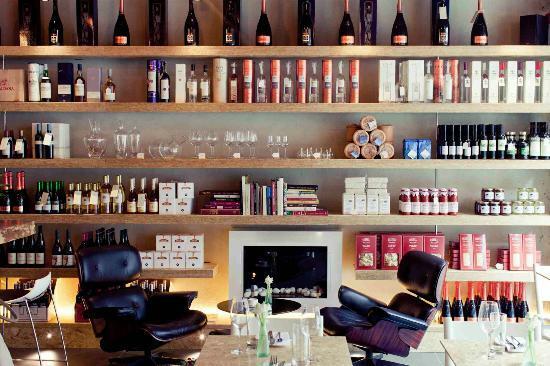 Books, laying on the wooden shelves are the design element of Dalla Terra wine-bar. This decoration is simple, but original. It’s the subject, you want to reach for and just lost yourself in intriguing lecture. The advantage of bio fireplace is its filigree construction. The device does not take up more space, built-in wall it will match to the interior project, warm it up and emphasise the style. Burner, protected by glass cover, is safe, does not produce smoke or unpleasant smell. The construction of bio fireplace is very important for restorers, it does not need any chimney-ventillation system, it could be easily relocated, depending on interior style. Bio fireplace is the additional value for the charming climate of a wine-bar. It adds warmth and mildness. It is a unique trump. It makes the place for connoisseurs and gourmets more like a rendezvous in warm atmosphere.